In accordance with my goal to read a book every week, (it’s now two per week) I often ask fellow readers for lists of their favourite books. John Steinbeck frequents these lists so I decided to read some of his books this month. I’ve read four of six that I borrowed from the library. Among them was a gem of a book called The Pearl. It is a story about a poor indigenous pearl diver who finds the “Pearl of the World”. The consequences spawned by this once-in-a-lifetime event bring to mind stories of modern-day lottery winners. The main character wrestles with many issues including how his sudden fortune changed his relationships with his friends and neighbours. 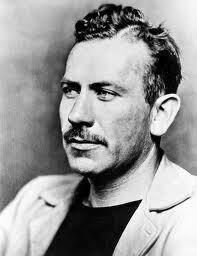 Steinbeck has an innate understanding of human nature and paints his characters with vibrant dialogue. His books read more like plays than novels, a style I find refreshing and appealing. The Pearl is rife with foreshadowing and symbolism, which the reader can sense even if she doesn’t fully understand. It almost felt like I was reading poetry. After reading The Pearl, I feel like I have a new perspective on the human soul. Perhaps you will enjoy reading this book too. One of the miracles of reading a classic book or a classic author is the moment when I suddenly understand a quote or a joke that refers to an idea revealed in the pages of that book. It’s like gaining insight one pixel at a time. Having finally read some Steinbeck I feel wiser somehow and a little like I’ve joined a new club. Now John Steinbeck is on my list of favourite authors, but that’s just One Woman’s Opinion.